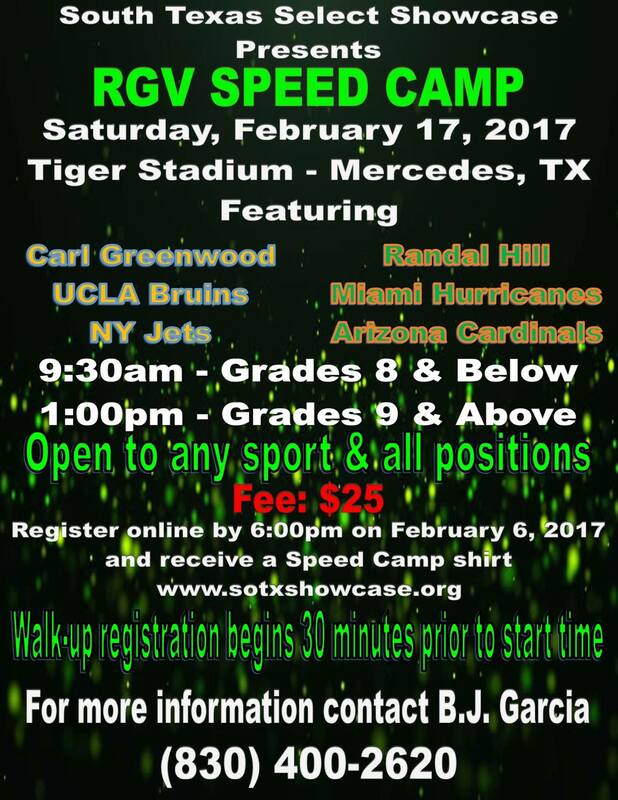 South Texas Select Showcase (STSS) will kick off the camp season with the RGV Speed Camp. STSS, in conjunction with RGV Pop Warner, will be hosting the camp on February 17, 2018, at Tiger Stadium in Mercedes, Tx. The camp will feature former UCLA Bruins and New York Jets defensive back Carl Greenwood, and former Miami Hurricanes and Arizona Cardinals wide receiver Randal Hill. Particpants who register on Eventbrite by 6:00pm on February 5, 2018 will receive a Speed Camp shirt. Walk-up registration will begin 30 minutes prior to the start of each camp. Grades 8 & below will begin at 9:30am on February 17, 2018, while Grades 9 & above will follow at 1:00pm. The RGV Speed Camp is open to any sport and position. For questions please contact B.J. Garcia at (830) 400-2620.